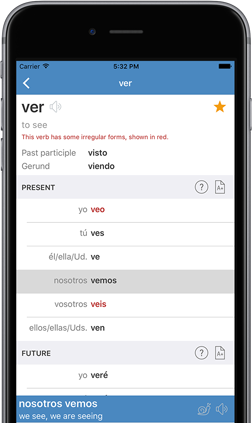 The Linguasorb Spanish Verbs app is the most feature rich conjugation app available. I use this in conjunction with Rosetta Stone and Duolingo. Very helpful! Simple. Has all the verbs and endings organised by popularity or you can search for any one you want. Fantastic app. Really helpful when learning a language to have a 'go to' place for verb conjugations. Have been a long time user of the website and glad to finally see it get an app too! This is the best resource out there for learning Spanish - great stuff! So useful. If you only use on Spanish verb app make it this one. Well done to all involved. Easy to use and a great reference tool! Very comprehensive list of verbs. Overall a very helpful app for those wishing to perfect their Spanish grammar.